Eleven (11) US 1928-1957 assorted notes, including 5 silver certificates. 1st-2nd items: One (1) 1934 and one (1) 1934-A US $5 silver certificates depicting the portrait of President Abraham Lincoln. Serial # C88466755A/ pp C, 1934, F69127375A/ pp A, 1957-A. Both with Julian/Morgenthau signatures. 2nd item: 1935A US $1 "Hawaii" silver certificate, depicting the portrait of George Washington. Serial # S51015387C/ pp C. Julian/Morgenthau signatures. 4th-5th items: One (1) 1957 and one (1) 1957-A US $1 silver certificates, depicting the portrait of George Washington. Serial # A02640026A/ pp E, 1957, A06056108A/ pp G, 1957-A. Priest/Anderson signatures, 1957, Smith/Dillon signatures, 1957-A. 6th item: 1928-D US $2 Red Seal Legal Tender note, depicting the portrait of Thomas Jefferson. Serial # D22219306A/ pp D. Julian/Morgenthau signatures. 7th-8th items: One (1) 1928 and one (1) 1928-B Red Seal Legal Tender notes, depicting the portrait of President Abraham Lincoln. Serial # A36267810A/ pp F, 1928, E40930324A/ pp D, 1928-B. Woods/Mellon signatures, 1928, Julian/Morgenthau signatures. 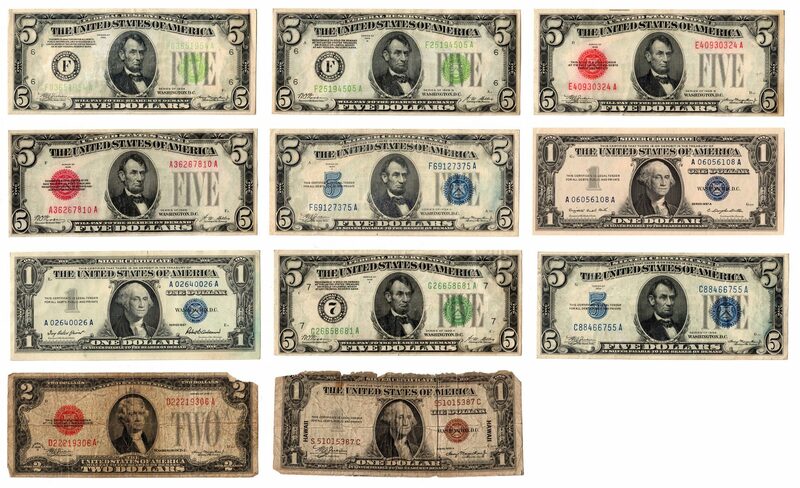 9th-11th items: One (1) 1928-A, one (1) 1928-B, and one (1) 1934 US $5 Federal Reserve bank notes depicting the portrait of President Abraham Lincoln. Serial # G26658681A/ pp C, 1928-A, F25194505A/ pp A, 1928-B, F03651954A/ pp F, 1934. Woods/Mellon signatures, 1928-A and 1928 B, Julian/Morganthau signatures. Provenance: the collection of the late James A. Newman (Nashville, TN, 1892-1964). CONDITION: 1st-2nd items: Fine/Very Fine condition. 3rd item: Good/Very Good condition. 4th-5th items: Very Fine/Extremely Fine condition. 6th item: Good condition. 7th-8th items: Fine/Very Fine condition. 9th-11th items: Fine/Very Fine condition.